"I managed the war like a true soldier ..."
What is termed the White Flag case has caused much controversy over the last two years. A number of different versions have been advanced as to what has happened, and debate over this will not die down. Sarath Fonseka, both when he was serving as Chief of the General Staff, and when he was a Presidential candidate, is alleged to have made statements about the matter, and government has also kept the matter in the public eye through a case that has been brought against Fonseka. It is clearly not a matter that can be ignored. What seems uncontested is that several LTTE operatives, including the head of its political wing, the former Sri Lankan policeman Mr Nadesan, and the head of the LTTE Peace Secretariat, Mr Pulidevan, were killed in the last days of the war. As Mr Pulidevan’s counterpart in Colombo, I feel a particular interest in his fate, though he never spoke to me in spite of several efforts to get in touch. As for Mr Nadesan, the Sri Lanka Monitoring Mission, which tried to help me make contact, thought he was more inclined to talk than his predecessor, and actually called me from Kilinochchi to say contact might be possible. But that too came to nothing, and I feel that any positive feelings he might have had fell prey to his leader’s intransigence. 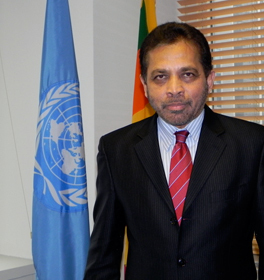 To get back to his fate, it is also not contested that our Foreign Secretary, Palitha Kohona, now Ambassador to the UN, was in contact with those who were trying to arrange a surrender, and made suggestions as to how this should be accomplished. What is in doubt is whether Palitha conveyed this to the Sri Lankan government and obtained assurances of safety. On the basis of this uncertainty, harsh allegations have been made against Dr Kohona, including a charge of war crimes. I suspect this was done when it was rumoured that he might be appointed as our High Commissioner to London, and the matter may now be forgotten. But one reason I believe an inquiry is necessary is that his name should be cleared of what seems to me unfair denigration. The impression sought to be created is that he got involved, not because he was trying to help, but because he intended to betray those who might act as he recommended. I believe that to be a ridiculous charge, not only because it is not at all in character, but also because the policy of the Sri Lankan government throughout, as exemplified by its current relations with former LTTE leaders who came into its custody, is to work with them if possible in the primary goal of eliminating terrorism and terrorist inclinations. Mr Nadesan would, if the SLMM were right, have been a positive element in this regard, and Mr Pulidevan, who had also been sidelined at the end by the LTTE leadership, would have followed suit. The allegations against Dr Kohona, and by extension the Sri Lankan government, are not only absurd, the stories that have emerged suggest clearly that they are false. Conversely, while it is possible that Pulidevan and Nadesan and others with them did not carry white flags with them when they emerged into areas under full government control in the midst of heavy fighting, that possibility too seems unlikely, given the communications that had taken place, and the different approach they seem to have taken from the rest of the LTTE leadership. At the same time it cannot be discounted that the communications were part of a strategy to facilitate the escape of others whilst they were distracting the forces. That is a possibility that, even if they had known of the discussions that had taken place, which is not established, the Sri Lankan forces on the ground would have had to keep in mind. Assuming that this group of potential surrendees was genuine and indeed carried white flags, it is possible that the forces they came across did not see the flags in the heat of battle. It is possible that they saw them but, fearful of ploys used by suicide cadres pretending to surrender, they felt they could not take the risk of being killed themselves. And it is also possible that, seeing a large group of individuals who were obviously cadres, they eliminated them as the Americans did Osama bin Laden, even when he was not a threat to them, in the belief that he would otherwise continue an insidious danger. These possibilities do not I believe constitute war crimes, except in a technical sense, which the actions taken with regard to bin Laden indicate will not be seen as deserving of indictment and punishment, though they are manifestly regrettable. This of course presupposes that the troops that Nadesan and his group confronted were not aware that surrender had been discussed, and had not been told specifically to eliminate those who came out carrying white flags at a particular point. Fonseka did not mention at that stage who sent him these messages which he belittled in his effort to declare that ‘We destroyed any one connected with the LTTE. That is how we won the war’. 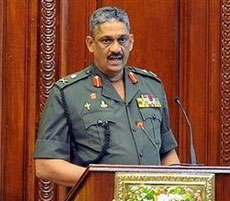 The repeated critique of those ‘in air conditioned rooms’ seems a reference to the Secretary of Defence, but this could have been only because Fonseka wished to denigrate the latter while taking all credit himself, before this particular audience, for ignoring the ‘ messages not to shoot those who are carrying white flags’. Some months later Fonseka changed his tune according to the ‘Sunday Leader’, which was supporting his candidacy for the Presidency. It was doing so however more in terms of its relentless animosity towards the incumbent President than any positive feelings towards Fonseka, whom it had repeatedly criticized in the past for what it described as hardline views. Its support therefore was based on the assumption that Fonseka would be a tool in the hands of the opposition UNP, which was also supporting his candidacy, in the belief that he would appoint its leader Ranil Wickremesinghe as Prime Minister and allow him decision making powers. In reacting to this report, government stressed that Fonseka was letting down the army he had commanded. While this was true, there was little emphasis on the falsehood of what was said, which could also have been stressed through comparison with Fonseka’s earlier statement. Fonseka panicked at the line the government took and, according to the editor of the ‘Leader’, ‘walked into the government’s trap…Fonseka’s garbled and gradual retraction destroyed his credibility’. The ‘Leader’ however claimed that Fonseka ‘never showed any enthusiasm for the denial always admitting that he had said what he had said’, and indicated that the UNP was less upset by what had happened as opposed to the JVP, which had always been as hard on the LTTE as Fonseka before his emergence as a common opposition candidate. Some light on the contradictory positions that Fonseka took up was shed by the journalist D B S Jeyaraj, who gave his version in an article posted on December 30th, just a couple of weeks after Fonseka’a allegation against the Defence Secretary and his subsequent retraction. Whilst there is no certainty that Jeyaraj’s version is accurate, he is a generally reliable journalist who usually has good reasons for what he writes, even if sometimes mistakes occur. Jeyaraj wrote that ‘In an ironic twist of fate the LTTE leaders intending to surrender to the 58 division fell into the hands of the special forces operating in Soth-east Mullivaaikkaal before reaching their avowed destination… Some of the injured cadres put up a last ditch stand fighting with dwindling ammunition. They were reportedly led by Ramesh and Ilango who died a heroic death facing fearful odds. Many consumed cyanide or blew themselves up with grenades. Many people were shot dead or blown up with grenades by the Special Force personnel. Despite this whole-sale massacre by sections of the SF personnel some other soldiers also saved the lives of people numbering a few hundred…. According to a highly placed source in the defence establishment the defence secretary had informed 58 division commander Shavendra Silva beforehand that some tiger leaders may surrender and if that happens the surrender was to be accepted and safety guaranteed…The source also said that Gotabhaya Rajapakse had told Sarath Fonseka of the proposed surrender plans by telephone at 3.30 am on Monday May 18th. Hours later when the Defence secy had contacted the Army chief to find out what happened he learnt that “it was all over”. While the Govt had agreed to a surrender the Army had presented it with a “fait accompli”. In that context it is perplexing at best and irritating at worst to see the ex- army chief trying to draw across a red herring by initially blaming Gotabhaya and Shavendra for the incident and subsequently changing his story….While implicitly blaming Gota and Shavendra, Sarath seems to be trying to score by denying that such an incident ever happened and that he would stand by his men under any circumstances. It does seem chicanery of the despicable sort for a man to turn around and blame the wrong guys when almost any high-ranking military officer in Sri Lanka knows that the special forces bumped off Nadesan and Pulidevan. In a sense Fonseka is putting Gotabhaya Rajapakse and Shavendra Silva on the spot as he knows that both at this juncture cannot reveal who was responsible for the killing. However it does seem that in his anger against Gotabhaya Sarath has shot himself in the foot by tacitly admitting that some tiger leaders had indeed been killed in cold blood…. gone terribly wrong. Wittingly or unwittingly Sarath Fonseka has opened up a can of worms. He may dispute he ever said what he reportedly stated and deny that it ever happened but the issue is now widely debated. Likewise Fonseka’s detractors may blame him for creating an unnecessary controversy but the fact remains that the incident of cold-blooded killing will not go away or be wished away. Given the scale of international participation in the surrender episode and its widespread ramifications the Colombo regime cannot afford to be complacent. It would indeed be galling for a regime riding a triumphalist wave to admit openly that its soldiers could be guilty of a war crime. However bitter it may be the best option for the Govt is to conduct a credible,transparent probe into the incident. There are many unasked and unanswered questions. What went wrong? Why did this group get shot despite pre-planning a surrender while thousands of ad-hoc surrendees are safe and sound? Had Colombo genuinely agreed to the surrender or was there an ulterior motive? Was there a break-down in communications between the high command and field command? Was there a sinister motive by the former army chief to teach the Defence secretary a lesson for agreeing to a surrender without consulting him? Were the special forces behaving recklessly as tigers had been attacking the army while pretending to be civilians? These are but some of the queries needing answers. Jeyaraj’s account seems a damning indictment of Fonseka, but details he reveals suggest that the story is not quite so simple. Those attempting to surrender seem to have come out at the wrong place, so both Fonseka’s versions about particular instructions being given to those who finally dealt with them seem irrelevant. Secondly, the potential surrendees are revealed as having ammunition including grenades, which suggests the forces who met them were right to be circumspect. Thirdly, it is indicated that some soldiers saved the lives of those they were dealing with, which is unlikely had they been given orders to kill them. Given all this, it would seem that the case is not as clearcut as Fonseka suggested in either of his interviews, one in which he seemed to take credit for the deaths of people trying to surrender, the other in which he initially attempted to blame others, though subsequently retracting the story. I believe then that an inquiry will show that what happened accords with the suggestions I have made above of actions which could only be war crimes in a technical sense, even assuming that fear of armed personnel is not excuse enough – whether or not there were white flags, and whether or not they were seen, the record of the LTTE gave ample reasons for suspicion. If indeed the potential surrendees came out at the wrong place, and bearing weapons at that, blame can hardly attach to those who confronted them. Such an inquiry as mentioned is owed not only to our former Foreign Secretary, who performed such yeoman service in various positions, but also to the forces who are the subject of harsh criticism. Given that this incident is perhaps the gravest charge made against them, establishing insofar as is possible what took place would be salutary for all concerned. This is now even more vital, given a recent TamilNet account of a meeting with Ambassador Blake. Though he is criticized in the report for what is termed ‘his personal bias towards shielding the Rajapaksa family’, it is claimed that he said that ‘The best evidence will come from SL generals, but they”ll want immunity and protection for their family’. I have mentioned before elements in the American embassy who had tried to suborn officers of our forces, but I had rather hoped that this was an individual initiative. I now fear that the stories that circulated a couple of years back, that the Americans were behind Sarath Fonseka’s candidature, and that is why the TNA was persuaded to support someone whose whole philosophy was opposed to what they needed for their people, may have to be kept in mind. I continue to believe that America will in the end follow the sensible line of the Defence Attache, but we cannot be too careful. As Yeats put it so eloquently many years ago, we live in a world in which the best lack all conviction, while the worst are full of passionate intensity.